Devorah Sperber, After Picasso (Gertrude Stein), 2006. 5,024 spools of thread, stainless steel ball chain and hanging apparatus, clear acrylic viewing sphere, metal stand (122″ h x 100”w x 72″d). © 2006 by Devorah Sperber. Permission to reprint may be obtained only from the artist. This work appears on the cover of the Autumn 2015 issue of Signs. After Picasso (Gertrude Stein) debuted in Sperber’s 2007 solo exhibition at the Brooklyn Museum, Eye of the Artist: The Work of Devorah Sperber, which then traveled to Mass Moca, Boise Art Museum, Knoxville Museum of Art, and Kimball Art Center. 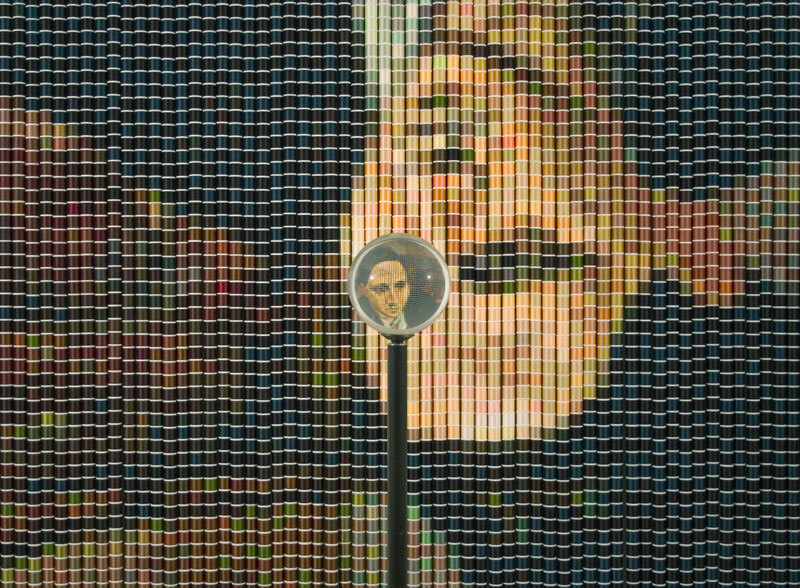 Using ordinary spools thread, Sperber creates pixilated, inverted images of masterpieces, which appear as colorful abstractions to the naked eye. When viewed with optical devices, however, the works becomes immediately recognizable as the famous paintings. The imagery is upside down in reference to the fact that the lens of the eye projects an inverted image of the world onto the retina, which is corrected by the brain. A clear acrylic sphere, positioned in front of each work, functions like the human eye and brain, not only inverting but also focusing the image so that it appears as a sharp, faithful, right-side-up reproduction of the famous painting. This shift in perception functions as a dramatic mechanism to present the idea that there is no one truth or reality, emphasizing subjective reality vs. an absolute truth. Devorah Sperber lived and worked in New York City and Woodstock, New York, for twenty-five years (1989–2014). She currently maintains strong ties to New York City but spends a majority of her time in Boulder, Colorado. Since 1999, Sperber has created a series of large-scale installations and multipart works, which utilize pixilated, photo-based representation in formats that fluctuate between representation and abstraction. In 2002 she was invited to create a site-specific installation at the Montclair Art Museum. The resulting installation, based on Edward Hopper’s Coast Guard Station (1927), was the catalyst for a series of artwork based on other artworks. The concept was based on the technology of printmaking and how mechanical reproductions alter images and the scale of artworks as they exist in the mind’s eye. Large-scale public works by Sperber can be seen in the lobby of One Penn Plaza, New York City; Centro Medico Train Station, San Juan, Puerto Rico; the Royal Caribbean cruise ship Independence of the Seas; a corporate lobby in Arlington, Virginia; and the lobby of Fashion 26 Hotel, New York City.